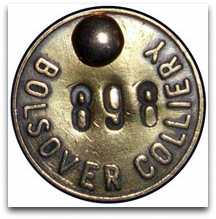 Bolsover (North Derbyshire) sunk in 1890-1891 by the Bolsover Colliery Co with 12 men to the west of Bolsover Town, was closed through exhaustion on 7th May 1993 after 103 years. Highest ever manpower was 2,042 in 1925 and highest tonnage 710,987 tonnes in 1978-1979. No3 shaft 21ft (6.4m) dia 365½ yards (334m) deep, started in 1923 but suspended in Nov 1926, restarted Dec 1927 but at 665 yards (608m) deep suspended again until Mar 1932 and not completed until Aug 1932 at 737 yards (674m). This was the first pit sunk by the Bolsover Colliery Company to the rich Top Hard seam, 6 feet thick (1.80m). Emerson Bainbridge leased lands in 1889. The dip of the seams varied from 1in3 on the anticline to 1in40. Production started Sep 1891 and it was the first pit to achieve a production of 3,000 tons in a day. A model village of 200 houses was built 1891-1894. The houses at 3s 6d (17½p) rent for a 3 bed roomed one and 3s 0d (15p) for a smaller one were well equipped with front garden, allotment gardens, pig sty etc. As well as a school (1893), co-operative store, welfare institute for indoor activities and games, a Methodist and an Anglican church, playing fields for cricket, football, hockey, bowling green etc was provided also. Boys and Girls Brigades and SJAB (St John’s Ambulance Brigades) were set up as well as a colliery brass band. 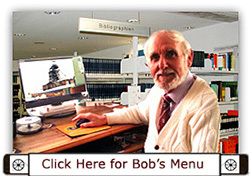 The village was self contained and the company had their own ‘bobby’ to keep the villagers in check. Coal cutting machines were introduced in 1932 to all faces where colliers hand-filled onto the face conveyors which in turn delivered onto gate conveyors to outbye loading points where tubs were filled then transported to the pit bottom by rope haulages. A new screening and washing plant was operational in 1933 and in 1936 a flocculation plant installed. Pit head baths were opened in Apr 1935. In 1942 American machinery installed with mechanised stone loader introduced in 1943 and by 1944 Joy Loaders and shuttle cars were being used for coal production. An aerial ropeway to the dirt tip was commissioned in 1943. Diesel locos were operational underground in 1945. Further housing was built by the NCB after 1947. 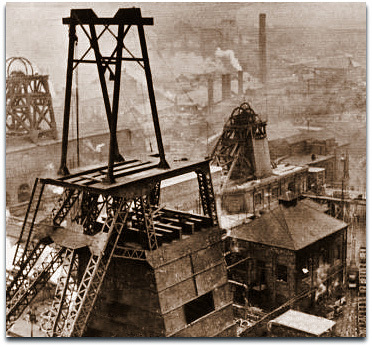 The brickworks were producing up to 20,000 bricks a day for use at the colliery. In June 1950 a major change to continuous mining with the introduction of 6 Gloster getter coal cutting machines. There was a connection through to Ramcroft. An Anderton shearer was introduced in 1957/58. No2 shaft was electrified in 1961. No1 shaft was dispensed with in 1974. 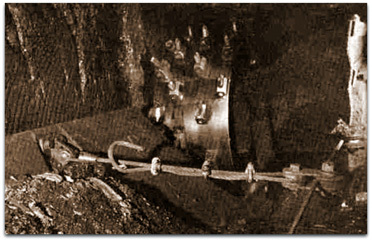 Electric winder installed at No3 shaft and Skip winding in 1976. The pit was locally referred to as Bowser. Underground locos: 3’ 0” gauge 2 x 0-4-0 DMF 50hp HE 1945 and 1947, 6 x 0-6-0 DMF 100hp HE 1948, 2’ 0” gauge 4wBEF CRT3+ CE 1977. Blackshale 4’ 5” (1.35m) Sep 1932 - 22nd Aug 1942. 1946: 1,170 DH, 380 s/f, total 1,550 men and boys. 1993/94: tonnes. Colliery closed May 1993.